Yes, yes... the list goes on and I hear your laments and gnashing of teeth. But Ica n't do anything about it. I simply don't have the precision... the craft... the sharpitude. But I know someone that does. 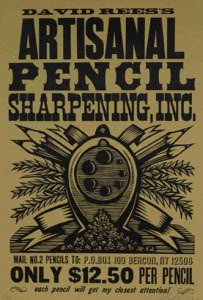 AN ARTISANAL PENCIL SHARPENING BUSINESS! YET WE DO IT ALL THE TIME! All you have to do is send your #2 pencils to Mr. Rees and for $12.50 a piece he'll sharpen them to a precision graded point. What's that? You say you think that $12.50 sounds kind of expensive? Each pencil that Mr. Rees receives gets his PERSONALIZED attention and is sharpened in the old-world tradition that pencils were meant to be sharpened in. All shavings are bagged, sealed, labeled, and returned to the owner to dispose of as they wish. After all, shavings are part of the pencil– and it’s YOUR pencil. Beware pencil-sharpening services that don’t return your shavings! They’re ripping you off! you're not 2000% sure of? and a limited edition copy of the poster shown above. He hasn't been called the 'The Hottest Blogger on the Scene' for nothin', you know. That's what I always said -- it's my pencil, damnit! Those shavings are MINE! Finally -- an HONEST pencil sharpener. 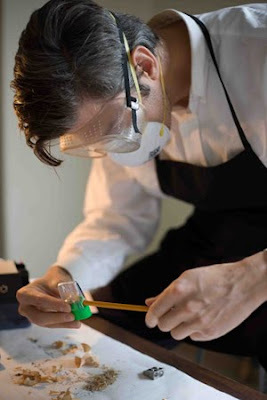 Can you still sharpen freehand using only a knife, or does this infringe Health and Safety Regulations? Of all the artisan pencil sharpeners I have used, thanks to your glowing review, Mr Rees may very well be the next. The value added by the print aside, that's a hell of a price, I have been charged up to twice as much previously and never received my shavings back. It's good to see honesty and professionalism are still alive and well. I'm hoping you'll update your website with discounts for bulk purchases? I really want a dozen. Surely an artisan would NEVER stoop to offering bulk discounts?! Did Michelangelo offer to paint the walls of the Sistine Chapel for half price after he had slapped two coats on the ceiling? I think not! P.T. Barnum was right. There is a sucker born every minute. Wow...I thought I had pretty much seen every scam out there. This is ridiculous. Anyone dumb enough to pay for this should just reconsider and send the money to me. I promise to think good thoughts about you for 25 seconds. That's worth it, right? I believe the people who made last two anonymous comments are missing...the point. That's a rather pointed comment! Perhaps those two posters aren't exactly "the sharpest pencils in the box"! This has got to be a joke.. Who is stupid enough to pay $12.50 to sharpen a pencil?! Stupid for $12.50? What would you say about $40? We just received our pencil, for which I and my kids have been waiting feverishly for weeks. It was everything we hoped for and more. There is nothing in the world quite as fulfilling as a properly sharpened pencil, it hints at the pinnacle of human civilization. Just gazing at it I feel as if I have channeled to my halcyon younger days, when a finely honed #2 meant the difference between success and humiliation. Was Mr. Warhol's painting "just a soup can"? Was the Mona Lisa a Sears portrait? I think not. Can I get some culture here, my good man? Haha this is great. My friend sent me the vimeo documentary and it's wonderful. People pay five dollars for a haircut, people pay sixty. And some people grow their hair for two years or shave it with a buzzer every two weeks. Money, time and what you do with yours are always silly, but pencils happen to be the start of great things on paper, so I think of this service as someone buying an expensive pen or a pricey bourbon to get in the mood to write. To each his own luxury. Thanks for the service, Mr. Rees. I'd love to say that I've been feverishly searching Craigslist, the yellow pages, Google, family, friends, neighbors, casual acquaintances, drug-, grocery-, dollar- store cashiers, my dry cleaner, mere strangers I run into at the coffeehouse and in the 7-11 parking lot for f#¢%'s sake =-O and don't even get me started on electronic- store clerks!!!! Who here can really say that they proactively have been looking for an individual that possesses this wondrous, rarely majestic talent & for this low of a price tag, that finally the gods smiled upon you because they led you here? Look man, can someone just tell me why I'm here???!!! It's BS!!! I don't know why that dictionary.com blogger decided to do this to its readers but I don't know who to be more pissed at right now. He or me??? As far as Mr.-$40-Pencil-Sharpener, I'd consider paying whatever an average pack of Ticoconderoga's cost, to install an app, teaching folks how to do this themselves....of course, I'd have to be convinced, which means it'd have to be the subject of much critical acclaim! Other than that, as a math student, a fictional writer, NOT TO MENTION, I've recently been told that, as an adult, I'm somewhat of an anomaly for believing that #1, any mechanical pencil thinner than 2mm, others may be able to comfortably use. I, however cannot. I'm shamefully heavy-handed, so it's wooden, or nothin' fer me. The second and must pertinent point is, one never outgrows, or gets too old for pencils. They don't run or smear. You can write from any angle. Eraseable pens don't erase fully, nor write evenly for all THAT MATTER. You lose the pen cap, the opening in separately sold cap erasers are way too huge to fit a pen. When the ink goes out on a disposable, there's no warning and when it's done, it's done. Wooden pencils cab be sharpened down as far as the metal hub that holds the eraser will let it. And aren't they biodegradable as well? The point & line that a pen makes is that alone. Pencils can be sharpened or softened, depending on how light/dark, thin/thick you'd like it to appear. In first-drafts, and even 'final' drafts that need proofreading, nothing else suffices, well...maybe in the latter instance a red-ink pen would be an exception. So honestly, what's not to love about a pencil? Oh, and as far as The Pencil Sharpener, more power to him. For fifty bucks though, he'd have to sharpen a lifetime of pencils for ME, AND include free shipping, BOTH WAYS!!! NUMBUH THREE AT COMIC CON! PAPA'S GOT A BRAND NEW (OLD) BAG!